One of my favorite things to do in Rocky Mountain National Park is to go and photograph waterfalls in dramatic weather conditions. The trick here is of course making sure the weather is not so dramatic that the waterfall is frozen or covered over with snow. This cold March morning at Alluvial Fan Falls along the Roaring River was one of these particular type of morning that I love being out in the field. 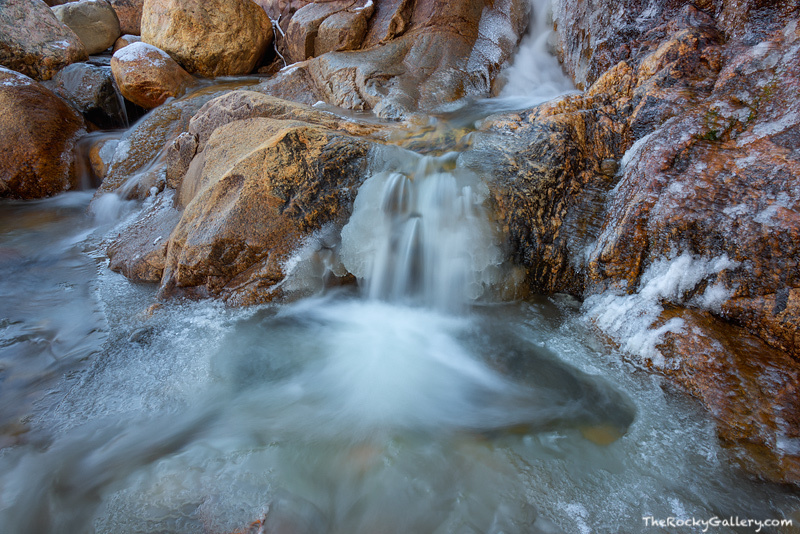 Snow, rain and mist from the waterfall had covered Alluvial Fan Falls in ice. The rocks around the waterfall were covered with a thick coat and trying to navigate around was difficult and dangerous. I finally was able to find open water near the top of the falls even though the rocks and much of the water flowing down Roaring Brook had frozen solid. Photo © copyright by Thomas Mangan.